The hanging death of a nondescript old man in a shabby little apartment in a meager section of the 87th Precinct is nothing much in this city, especially to detectives Carella and Meyer. But everyone has a story, and this old man's story stood to make some people a lot of money. His story takes Carella, Meyer, Brown, and Weeks on a search through seedy strip clubs and to the bright lights of the theater district. 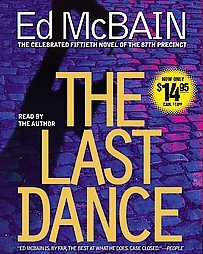 There they discover an upcoming musical with ties to a mysterious drug -- and a killer who stays until the last dance.